Branding options and customised promotions are available. Contact us for more details. 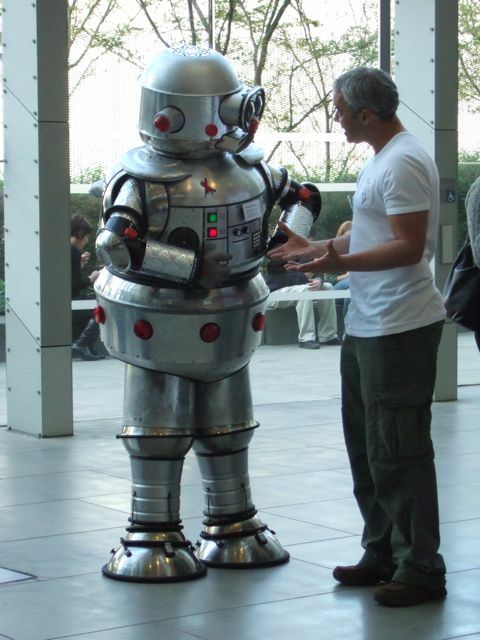 "Tubby the Robot was a huge hit amongst young and old! I myself couldn’t take my eyes off him, it was truly spectacular." "Once again Tubby was a hit and I have no doubt that businesses will be jumping over each other to sponsor him next year. Thanks again for being involved." "The performance was a wonderful photo opportunity and provided an outstanding level of interaction...One of the best roving acts we've ever had." "Tubby has a fantastic sense of humour which had all age-groups laughing loudly and learning through good old-fashioned fun." "Your intuitive ability to improvise and interact with a continuous crowd of inquiring children and their families is a credit to your artistic practice." "We received many positive comments from our clients on Tubby the Robot, in particular the way he cleverly interacted with the crowd." "Thanks for all your effort and flexibility in offering our visitors a unique and unforgettable experience!" "Tubby the Robot has that unique ability to capture children’s imagination and deliver something that is exciting and extremely popular." "Tubby is an absolute delight and we were astounded at how popular he was."